This is the second post in a 2 part series. 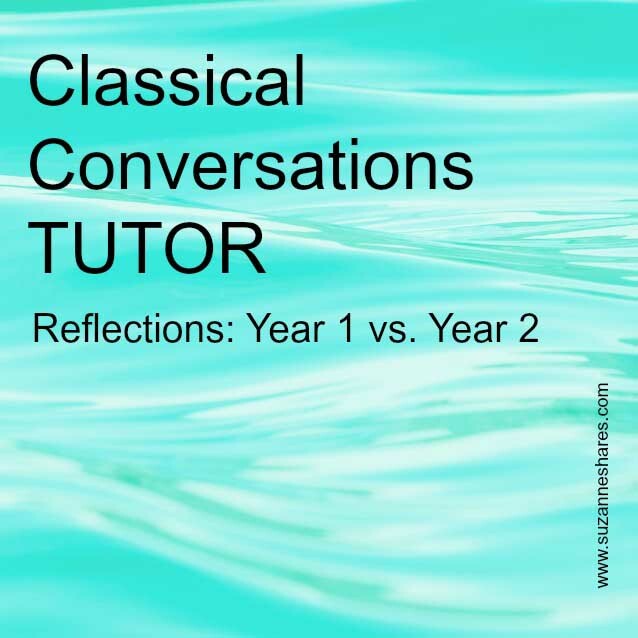 Read the first post, Classical Conversations PARENT: Year 1 vs. Year 2 here. This was my second year in Classical Conversations and my second year as a Foundations tutor. I wanted to pen my experience with Year 1 vs. Year 2 because they were night-and-day different. (Hallelujiah, says my husband!) My first year as a tutor was also the first year of our community. In May before our community launched in August, there were 3 families including mine signed up for CC. I was the only one qualified to tutor since I had homeschooled at least a year, and when weighing the options of 1) Tutor and have a CC Community or 2) Not tutor and maybe, possibly, hopefully have a CC Community, I decided to tutor. 🙂 Two weeks later I found myself in Tutor Training, which was outstanding. Yet I had never seen a CC “school day” or was yet to be fluent in the grammar of CC. Most of my 3 days of Tutor Training involved a “deer-in-the-headlights” look on my face with a general state of “mental fog.” There was too much information for my brain to process, and because I didn’t exactly know what I had signed up for, I was unable to take advantage of asking questions of the seasoned tutors around me. Alas, I jumped into tutoring with all my might and, in general, our family had a positive experience despite, personally, doing many things wrongly. Serving as a Foundations Tutor was a positive experience, but I was, also, my own worst enemy. Now that I have 2 years under my belt as a tutor, it is blatantly obvious to me what worked well and what did not. As a means of comparison between year 1 and year 2, here’s how I would summarize my physical, mental and emotional state after year 1: burned out, needed about 1 week of uninterrupted sleep, exhausted brain, and relieved it was OVER. We just finished our 2nd CC year about 3 weeks ago. In contrast, at Year 2’s conclusion, I felt joy and gratitude as I thought about my kiddos, their moms, and their accomplishments. Admittedly, I was ready for a summer break but eager to tutor again next year. I was energized and ready to start prepping and planning tutoring ideas for Cycle 3. To state the obvious, I was a different person year 1 vs. year 2, and I praise God for that! I have reflected on the causes behind the “pile of mush” tutor of year 1 and the invigorated, joyous tutor of year 2. In an attempt to avert you from making my same mistakes, I thought I would put my conclusions down on paper on my blog praying all the while that they will be encouraging and helpful for someone embarking on serving as a Foundations tutor. Enjoy! I have taught, and probably always will teach, the sweet little Abecedarians! Both years as a tutor, I have had the youngest 8 children in our community. I am in my element with 4 and 5 year olds, and it is crazy fun! When I started tutoring my first year, I wanted my CC class to be fun and memorable for the kids. For most of the children, this was their first year of school, and I wanted it to be forever etched in their brains…as an amazing experience! Isn’t that what kindergarten is for?!?!? Amazing memories?? During that year, I made cute, crafty things for almost every subject during New Grammar. It was “Glitter and Glam” each week. This reality makes me LAUGH OUT LOUD now!!! Can you say, “Totally missing the point?!?!? My expectations of myself and what should happen during New Grammar were unreasonable and missed the mark! The papers, crafty things were “glitter and glam” and precious, but they were not necessary and extremely time consuming for me to prep weekly. If you’ve been around CC for longer than 5 minutes, you’ve probably heard the phrase “stick in the sand.” This is the idea and philosophy in direct opposition to my “glitter and glam” philosophy from year 1. The “stick in the sand” method incorporates basic, simplistic, “no frills” resources, tools, and activities during New Grammar to aid the children in memorization. After reaching the point of burnout at year 1’s conclusion, I made a vow that I would scale it WAY BACK during New Grammar and incorporate more “stick in the sand” techniques for year 2. Instead of creating cutesy self-made clip art creations that suited my fancy, I used simple pencil and paper stick figure drawings for a History Statement or the “erase a word at a time” method for memorizing Latin. And, of course, we sang lots & lots of songs! The result in the classroom, you ask? My year 2 Abecedarians had just as much fun with the “stick in the sand” activities, and they memorized the New Grammar effortlessly. The result for me as a tutor? Tutoring was much more enjoyable and planning weekly felt less like an albatross thanks to the simplicity of “stick in the sand.” Please hear me that fun, creative, cutesy activities for New Grammar aren’t innately evil, but if they are becoming the proverbial tail that wags the dog, ditch them! Remember–less really is more! I think shifting from “glitter to glam” to “stick in the sand” also positively impacted the parents in my class for year 2. The first year I was concerned more with the children having fun and being an “expert” tutor. I rarely gave thought to whether or not my classroom activities were transferable to their homes. I knew that one of Classical Conversations’ goals is for the tutor to train the parents in ways to implement the classical model at home. In fact, this was one of the reasons that drew me to CC. Honestly, though, year 1 as a tutor, I am quite confident that I was undercutting the parents’ motivation to try things at home. The activities and resources that I incorporated into class were too labor-intensive, and I’m sure that was intimidating to the parents. Very little of what I used in class during year 1 was replicable at home. Year 2, on the contrary, I have seen the proof in the pudding that less is more. I had many of the moms tell me how their time at home was spent practicing songs, drawing their own stick figure cards for history statement and reviewing the hand motions from class. Honestly, before they told me, I knew that my Moms were reviewing with their children at home! It was blatantly obvious each week during Review Game time. My little 4, 5, and 6 year olds remembered the New Grammar from week to week! Without even realizing it, my “scaling back” to “stick in the sand” was training the parents in my class. The simplistic methods and activities in class empowered them to try those same things at home. I was elated and felt so humbled to see my classroom spilling over into the homes of my sweet Abecedarians! As Foundations tutors, we have a wonderful opportunity to further train and encourage the parents in the ways of the classical model. What a joy and privilege! As I gear up over the summer for Year 3 of tutoring, I will continue in the ways of Year 2–intentionally seeking ways to encourage my parents in class. One shift for me in Year 2 was an intentional effort to do the majority of my planning earlier in the week. Our CC Community day is Monday. During Year 1, there were many Sunday nights when I kept the midnight oil (or later!) burning while I put the finishing touches on the week’s New Grammar, Fine Arts, Science Experiment, and Review Game. My goal this past year was to not make that same mistake twice! 🙂 Year 2’s plan was to write the New Grammar for the upcoming week on my Tri-Fold Dry Erase Board by Thursday. By doing this work on Thursdays, it gave me a couple of days to mull over, think through the New Grammar and how I would teach it to my Abecedarians. This worked much better than Year 1! Also, to help with planning in advance, I highly recommend CC Connected for any tutor (and non-tutoring parents, too, honestly!) CC Connected is an online file sharing program. CC participants from the world over upload their resources for the varioius cycles and New Grammar subjects here; it, truly, is amazing! It is, hands down, worth the monthly fee ($3 for tutors, $6 non-tutoring parents). My CC Connected subscription has also helped me tackle planning multiple weeks in one sitting, which helped me in Year 2 curb my procrastinating habits of Year 1. Another way to get ahead of the game as a Foundations Tutor is to use your summer to prepare! 🙂 As I mentioned previously, I was a hot mess at the conclusion of Year 1; I was burned totally out! It took me the entire summer between Year 1 and Year 2 to recover. However, since I scaled down my “glimmer and glam” approach to tutoring in Year 2, I am entering the summer looking towards Year 3 rejuvenated! Therefore, I am hoping to get a massive chunk of my Cycle 3 plans done this summer! As a tutor, I would be remiss to mention my BFF–my Tri-Fold Dry Erase Board. One of the other tutors in my community mentioned this to me during the summer prior to Year 1 of tutoring. Wow! I can’t imagine tutoring without my board! Read this previous post on how I use it in class and how to make your own at home with little effort! You won’t regret it! Being a CC tutor has been a great joy for me, personally. It has stretched me, given me the opportunity to be engaged with what my sons are learning in their CC classes, and allowed me the opportunity to learn a lot (that’s an understatement!). I pray that God will use the role of CC tutor in your life to give you a greater understanding of who He is and all that He has created for His glory! This is was of the greatest gifts I’ve received as a tutor; I pray it will be for you as well! What is the greatest lesson that you’ve learned–good or bad–as a tutor that you can share with readers? Comment below! I look forward to learning from you and gleaning from your wisdom! Last year was my first year in Cc and first year tutoring .. also the youngest abecedarians.. You are so RIGHT! I have your same tendencies.. But am slowly learning to stick with simplicity and Trust The Process if CC and the classical model! I DO need to start prepping sooner next year :). Love what you write! Thank you for the encouragement! This was the first year for our CC community, my first year as a tutor, and first year to have a child in all three levels!! It is so refreshing to know that I am not the only person who would volunteer to be a tutor in a new community, without ever experiencing it first hand, or having any remote idea how a seminar would look. I also understand your “deer in the headlights” feeling at practicum not knowing even what to ask all those seasoned moms and tutors. When I attended last summer, I was somewhere between awe and tears, because I so wanted to have this program for my children, but fearful at the same time thinking that I was not sure I could handle it. A few weeks later, I contracted to tutor, completed my training and then began our classes. Now that we have completed our first year, I am reflecting a bit. Challenge I (which I tutored) was a success, although at times I felt that I was merely keeping my head above water. Challenge A, which my second son attended was an amazing experience for him, and my daughter did amazingly well (mostly independently) in her Foundations and Essentials class. This summer, I will take your advice to rest and prepare. So excited for our year to come, but know that I need at least a week to unwind first. Thank you for sharing. I am so glad that you reminded us of these things. I want to get back to doing the notebooks this year. Before we were in CC and I was trying to implement the classical method on my own, we went to the park once a week with our science notebooks. I had the kids find a plant they were not familiar with and draw it. Then we went home, looked it up and labeled it with its common and latin names. We also kept century notebooks to record any history tidbits we learned. There was one spiral notebook for each century in history. I think this could be combined with our science sentences and timeline points – especially for the Essentials years. Ooooooooooooh, that is a great idea Gina! I love the century notebook idea! How did you organize each book? did you just enter events as you learned about them, or did you try to keep the entries in chronological order in the notebook? Thanks for sharing this idea!! I can’t wait to hear more! Thank you for this post! 🙂 Last year was my first year for everything: homeschooling, tutoring, Classical Conversations! Because my campus was a new campus, I was allowed to tutor without prior CC/homeschooling experience (though my parents homeschooled me!). Last year was challenging, and I definitely have a list of things I’m doing differently this upcoming year! I’m looking forward to a new year, and a new/better way of doing things! I’m planning on planning as much as I can this summer. And can I just say that this year my tutor training experience this year was not all that great…I wish there were different training options for returning tutors. I hope that your 2nd year of CC is refreshing and glorious as you tweak some of the ways you do Foundations as a Tutor and at home. By God’s grace, the changes that I made in year 2 made our second year much less stressful and enjoyable! Also, I would love to “pick your brain.” I am a Tutor Trainer for our area Practicum at the end of the month. I am going to send you an email right now. 🙂 I would love for you to reply if you have time and tell me more about your experience this year. I am about to start our CC journey, and tutor 4/5 year olds, and this post was EXTREMELY helpful for a newbie!!!!!!!!!!!!!!! Thank you thank you thank you!!!! !